I accompanied a friend to a watch sale during the week, where I saw a very paltry selection for women’s watches. Rather, smaller watches for the admittedly smaller wrists of women. There were lots of women happily snapping up (and depriving, hah!) the men of the watches on display though, and the lady manning the counter told me it was just “in” for women to wear a large watch instead of a smaller one. Many women were going for the oversized watch look which is very trendy now and which I believe has been so for a couple of years now. Whilst many fashion brands do make oversized watches for women, heading to the men’s selection gets you an instant oversized watch from a reputable watch maker without the fuss. Yet, I could never get into the trend for a very practical reason – wrist size. Have you? A few years ago, I actually wanted a large watch. But I soon realised that being blessed (or cursed, whichever way you look at it!) 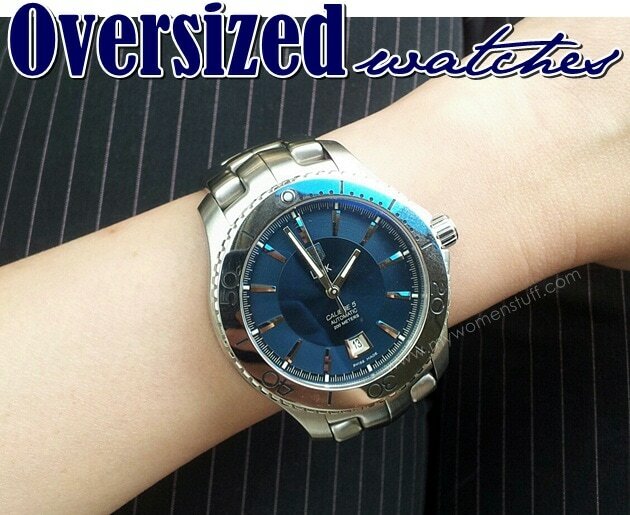 with a small wrist, I just could not comfortably wear a watch with a large face. Also, I found that metal straps (which I favour) have a minimum number of removable links and if you remove them all, it doesn’t look balanced. As for leather straps, few places would punch me an extra hole because then the remaining strap will wrap all the way around to the other end of the watch. I know, it was awkward. So I gave up. I’m fussy about watches, preferring only to go for proper watchmakers, not fashion watches so unbelievable as it is, selection from a good watchmaker for a medium sized watch face, is quite limited. And then, I stopped wearing watches. Are you into the oversized watch trend? Do you wear a watch daily? I like how it looks and I’m still looking for one that will work with my wrists. But I rarely wear a watch daily. I stopped because the battery in the watch I was wearing ran out. I eventually got an automatic one that didn’t need batteries but by then I’d forgotten what it was like to wear a watch, so I haven’t. You? I’ve been wearing oversized watches for years so I’m used to the heaviness. I prefer them over the smaller watches. I like the chunky looks. Oh my god my jaw just about dropped when i saw the watch, if its not because my mask has hardened on me. Nice! My brother recently gave me an oversized watch. Its face is definitely the biggest I’ve worn so far. I really like it, but I suppose that’s more because it was a gift from him than it being just a fashion item.